Trade war threats are among the factors slowing some sectors of Oregon's economy. From Oregon's agricultural production to semiconductor manufacturing, an array of industries is feeling the gray cloud caused by economic instability related to federal tariffs and threats of trade wars. Alexis Taylor, director of the Oregon Department of Agriculture, said the uncertainty around federal trade policy is causing concern in the local agricultural community, and for good reason. "Oregon is an export-dependent state, shipping 80 percent of its food and agricultural products out of state and 40 percent outside the U.S.," she said. "The state's farmers and ranchers depend on the ability to move their products, and Oregon's economy is dependent on a healthy agricultural economy worth about $50 billion, or 13 percent of the state's gross domestic product." Taylor noted that food and agriculture make up one of the state's largest employment sectors, providing jobs for more than 326,000 full- and part-time workers up and down the food supply chain. Oregon shipped nearly $2 billion in agricultural exports in 2016, and its top export markets are China, Malaysia, Vietnam, Canada, Japan, Korea and Taiwan. In its most recent Economic and Revenue Forecast, released in mid-November, the state's Office of Economic Analysis included federal tariffs in its short list of factors that will slow U.S. production and exports. While the direct economic impact of the imposed and proposed tariffs is not significant enough to derail the nation's economic expansion, the real risks lie in potential escalation. "Should a true trade war across many more products and including many more countries erupt, the economic impact will be widely felt," the forecast states. Oregon's semiconductor industry is among those in the manufacturing sector that returned to growth and seemed to be recovering well after the Great Recession. Its recovery slowed over the summer, though, and semiconductor billings joined housing permits and the strong U.S. dollar as indicators showing the largest weaknesses in the state's November economic forecast. SEMI, a global industry association representing the electronics manufacturing supply chain, noted that the semiconductor industry relies heavily on international trade and that since tariffs in China have been in force, companies in the semiconductor industry have faced higher costs, greater uncertainty and difficulty selling products abroad. On Dec. 12, the association issued a forecast that semiconductor equipment sales, which hit a record $62 billion in 2018, would reach a new high in 2020 after a "market reset" this year. Just five days later, it revised its forecast to show that total fab equipment spending this year will drop by 8 percent instead of increasing by 7 percent, and fab investment growth will fall by 10 percent. The Dec. 17 forecast also shows overall spending down 13 percent in the second half of 2018 and 16 percent in the first half of 2019. "Plunging memory prices and a sudden shift in companies' strategies in response to trade tensions are driving rapid drops in capital expenditures, especially among leading-edge memory manufacturers, some fabs in China, and some projects for mature nodes such as 28nm. Industry sectors expecting record-breaking growth in 2019, such as memory and China, are now leading the decline," the forecast states. 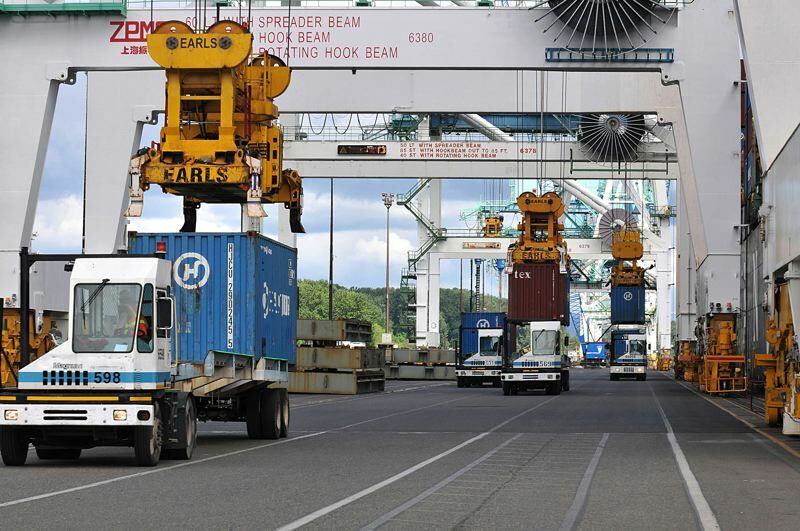 A November report from the Brookings Institute notes that while most communities across the country rely on international trade, it is a significant piece of the economy for Portland and a handful of other "port-focused metro areas." Even with more than 179 seaports across the country, the nation's seaborne trade is concentrated in a relatively small number of seaports. Just 20 ports in 18 metro areas move 94 percent of the commodities impacted by tariffs. This is partly because of equipment capacity such as the container cranes and grain elevators in Portland, according to the report. "If tariffs depress total trade, these ports could see reductions in business activity — leading to decreased labor hours, rising fiscal challenges, and an overall drag on local economic growth," the report states. "The urgency is only increasing as China formalizes a third round of tariffs and the Trump administration threatens further retaliatory action." The Port of Portland is the leader on the West Coast for auto exports. It exported more than 87,000 Ford vehicles in 2017, a 7.8 percent increase from the previous year. In 2016, the port handled more than 50,000 exports and the 2017 growth represented a 73 percent increase. The port credited growing demand for American cars in Asia and adding more space for auto staging in the Rivergate Industrial District near Terminal 6 for the increase in vehicle exports. Keith Leavitt, the port's chief commercial officer, said in a March press release that the growth translated into more than 600 direct local jobs for dockworkers, processors and others working in its supply chain.